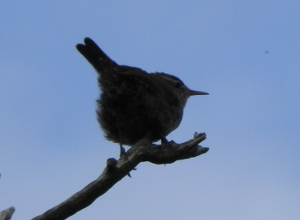 As The Dog and I dawdle along we often catch a glimpse of a wren. He is usually far to busy too stop and talk to us having important business to attend to in another part of the hedge. Being so small he flicks in and out of sight as he flits about – from his perspective the spaces in between the twigs and leaves give him huge gaps to move through and he seems to fly along the middle of the hedge as easily as he flies through clear space. This makes it almost impossible to get a photo of him. We do however have innumerable pictures of the hedge – just after he has flown on to his next appointment.